Hi, here is Monique taking a bubbly bath and she sure looks like she's enjoying it! Her big eyes are just showing so much enjoyment with her little yellow ducky. This post is for Sunshine Mail and we really, really, need your help in sending cards to these children. We also have so many requests and not enough cards to send, so please, send a card or two for a great cause. If you would like to be on our design team, please let us know. You only have to post twice a month, but you can send as many cards as you would like anytime. 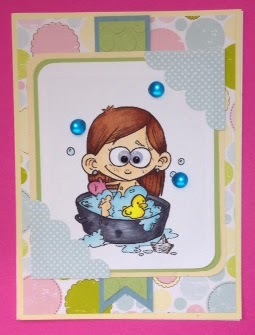 We just need help and those of you that are scrappers can make a card in a zip! Oops!! got a little carried away there. Here is my little Monique. 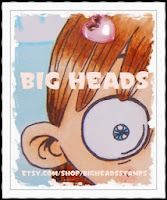 My image if from our generous sponsor Big Heads. All of the ingredients for my card is from stash. So please send cards and you can see all about Sunshine Mail here. So that is it for today and I hoped you enjoyed your visit.